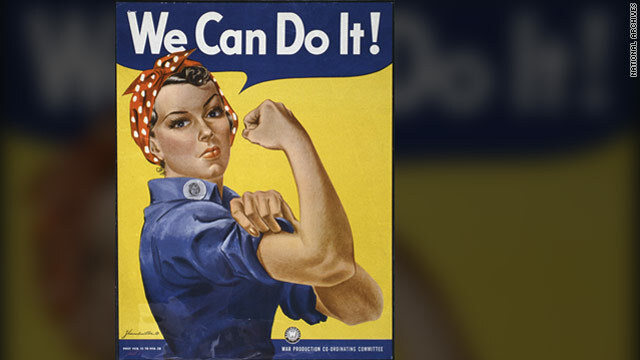 If a female representative of American society were selected today for this symbolic poster , she would have arms covered in tattoos, a nose and eye brow piercing, a rainbow pin on her shirt (don't confuse with skirt), empowered with the equivalent of a 4th grade education. Just to let you know this still is the Unted States and fate still exsists. What is it with all you fools? George didn't create all this mess, I did.... Now get it right. that is all that I read by most of you dumb a$$es posters. When are you going to find out the truth? Liberal trash has lied to you soooooo much that you have finally fallen for it. MORONS!!!!!!!!!!!!!!!!!!!!! Who was president in 2007 ? Oh yeah, Bush. So he could not stop any of the things you ranted about? Sounds like he was a pretty weak president. Oh and by the way the republicans controlled Congress until 2006. They were kicked out because the economy was tanking. Geraldine was my mother and she did quit the factory job, but got another job right away and worked most of her entire life. She met my father working at a soda fountain when he was a poor, struggling dental student from the Upper Peninsula of Michigan. Geraldine retired at age 75 when my father, Leo, retired at age 78. We grew up in a working family. Her beauty did not insure her a life of leisure. This woman worked hard as did my father. They both shared in the household chores, caring for and raising children, cleaning and cooking. They lost a son, Gary, in 1980-so life was NOT easy on them. They did come from the greatest generation and they are sorely missed. Thank you to those offering condolences. Condolences, she was the face of a nation! Thanks for her story.